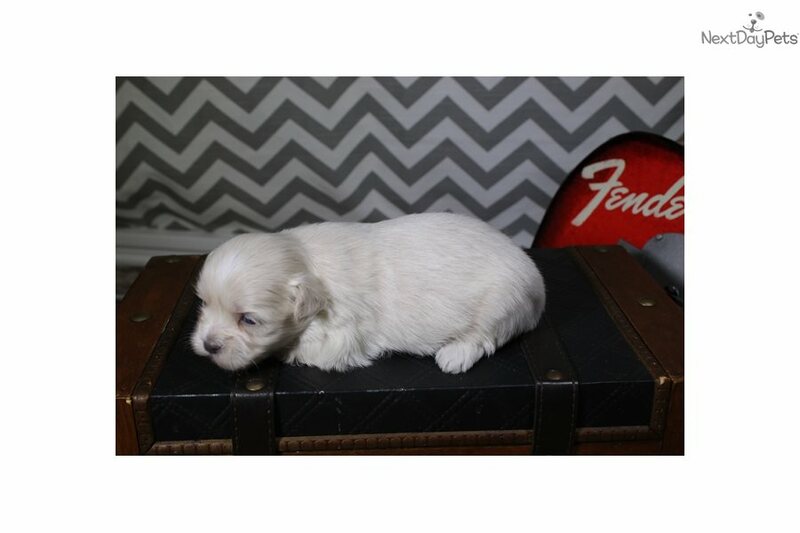 Meet our Shih Tzu/Coton de Tulear cross puppies! One of the fantastic qualities of these wonderful companions is their non shedding coats which are a gentle flowing coat of ultra soft waves which are generally kept relatively short, “puppy cut” style, but can also be left long. This mix is in the family of the Teddy Bear puppies, with just a bit more class. They have a wonderful sense of playfulness & a great love of toys as the Cotons do as well as a snuggly side from both sides. They are friendly, highly social, kid friendly, sturdy, calm dog which are truly a great mix. You will enjoy the length of nose that the Coton brings to the mix as the Teddy Bears will not have the snort & sinus problems that some Shih Tzus can. Their noses and faces are not extremely long on the other hand either, giving them a plump, full teddy bear appearance. We strive to keep all photos up to date, therefore the photos you see are indeed current. They will be ready to depart for forever homes 9 weeks following their birth. Puppies will leave with a microchip implanted (we also charge you the $20 registration fee and personally fill out that registration form and send that in for you, then provide you with the certificate documenting this registration into the nationwide program). Females are $1000 and males are $1000. We can provide prompt reply with a wealth of information if you email. WE ANSWER EVERY EMAIL WITHIN THE DAY, JUST MAKE SURE YOUR EMAIL SYSTEM IS SET UP TO ACCEPT OUR REPLY. CALL IF YOU DON'T HEAR FROM US. We strive to breed according to breed standards and pre-spoil them to bring about the best temperament and dispositions. All puppies are raised among family and accustomed to wheelchairs. We love to talk about our babies - email for a very prompt reply or give us a call! (please do observe the time zone difference, we are CST) Puppies can be flown most anywhere in the US for $250 using American or Delta or $295 using United. We will only use the most pet friendly airlines in the business. Safe flights available. Credit Cards accepted. A $200 non-refundable deposit will hold the puppy of your choice until he/she reaches appropriate travel age. Our parents are well within the breed standards for weight and height. Mom and Dad are pictures of health, always doing well on their yearly health exams – never needing anything other than routine care in between check ups. Of course we would expect their babies to follow suit. I am sure you would be pleased with them.